A gray wolf that fled Isle Royale National Park across a Lake Superior ice bridge and was found dead on the mainland had been shot with a pellet from an air gun, officials said Friday. The 5-year-old female, nicknamed “Isabelle” by researchers who monitor wolves and moose on the island park, was described as a loner that had been bullied by other wolves. She escaped this winter, seizing the rare opportunity to traverse at least 15 miles of ice separating Isle Royale from an area along the U.S.-Canadian border. Isabelle’s body was found Feb. 8 along the Minnesota shoreline on property owned by the Grand Portage Band of Lake Superior Chippewa. There were no visible wounds, and scientists initially said she apparently hadn’t been shot. But the pellet showed up during an X-ray, and a necropsy showed it had caused fatal internal damage. The pellet was a type used typically to hunt small animals such as squirrels, said Phyllis Green, the park superintendent. 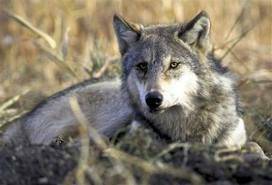 That suggests the shooter may have been trying to scare off the wolf instead of kill it, she said.